I can’t believe our little princess is already starting nursery! It’s been a week since J started and we have to admit that her adaptation has been, to our surprise, quite quick! She went through these settling sessions where she basically stayed there for a longer period every day. Sam and I went with her and stayed for an hour. She played around and had some fun, obviously happy and still because we were right there! Bless her, after that, she was washing her hands with the help of one of the key workers, and I took advantage to start my way off. As soon as I closed the door I heard her screaming, crying and yelling MAMAAA, MAMAAA! !OMG!…that just broke my heart. I felt horrible with myself and with the idea of “how in the world I could leave my child with these people that I’ve barely just known! !” So I went home, called Samuel, cried for a while and make myself understand that it was the best for her and for all of us, that it was time for her to socialize, do fun things and make some friends. I prayed, and then I prayed a bit more…that helped me calm down. I was the grown up, I am the one who could understand the reasons! After two hours I went to pick her up and she was playing nicely. WHAT A RELIEF! The Key worker was wonderful putting herself in my shoes and we decided to extend a bit longer the settling sessions. We’ve been praying every day for J to adapt quickly. Sam gave her a blessing on her first day, and with the blessings of our Heavenly Father putting the right people in our way and touching J’s heart, after a few sessions she’s completely settled in! She loves it. Well, when we ask her if she wants to go to “school” she clearly says NO, hahaha, but what kid wants to go to school anyway?! 😉 She is actually having a very good time there, doing painting, playing around and basically becoming a BIG GIRL. Since this blogpost we have had many other ‘first times!’. 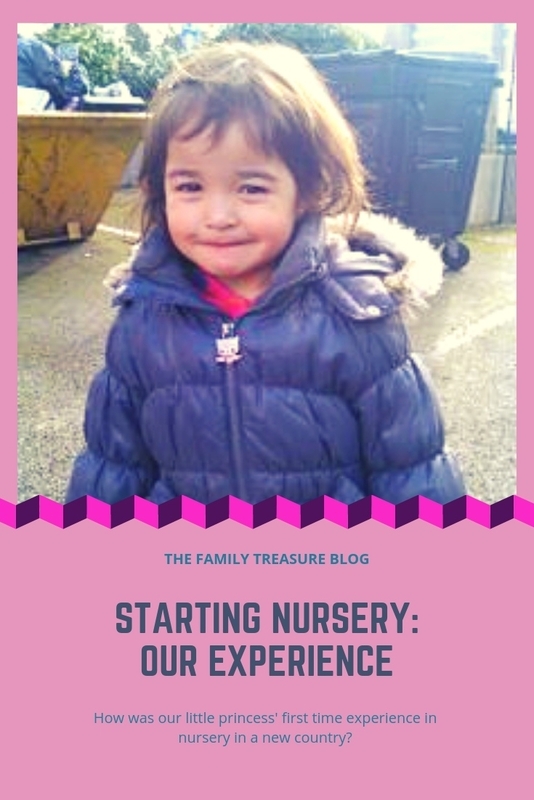 If you are a parent looking for a nursery place and you have recently moved into the UK, what about reading our blog post exclusively dedicated to explaining the process of ‘How to apply for Nursery‘ ? If you want to know how was our experience with her first day in Primary School you can find it here. Tell us! How has it been for you? Did your child/children get to settled in easily or was it a heart break like it was for us? Next Post Where has this year gone? !